I am not quite sure my other comment freaked out but feel free to delete! Haha. When reading the headline to this post, I was instantly intrigued. Then your opening sentences sound exactly like me! Online shopping is one of my guiltiest pleasures knowing I can browse all day long for items I like or want and then with just a couple simple clicks it can be on the way to my house just like that. I am like you though, when the price starts to jump, I start questioning if I really need this or that or the other thing. I then just kind of exit my screen and move on. I think shopping cart abandonment is a big deal in today’s digital shopping culture as almost everyone I know does it. 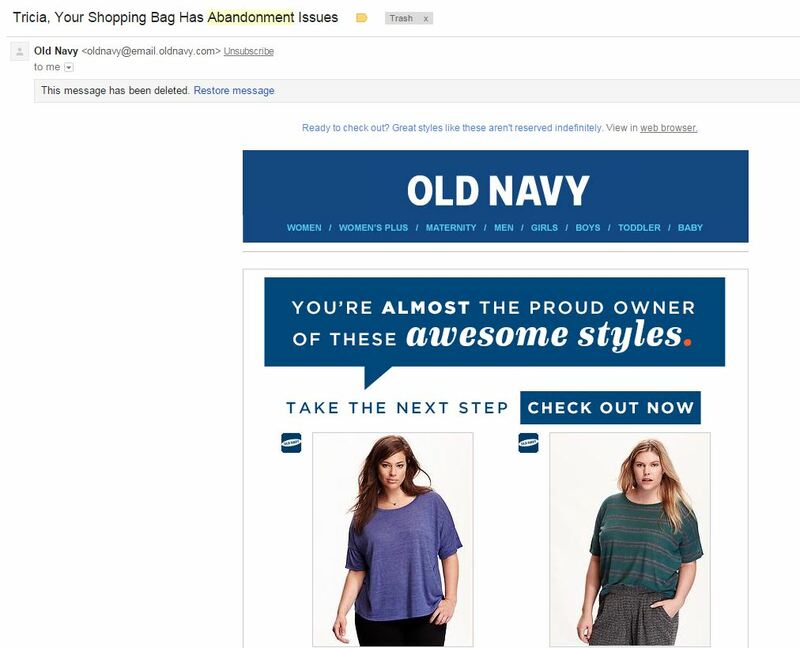 The email Old Navy sent you after you left items in their cart is becoming a very common practice indeed. I see these all the time now and even emails gesturing me to come back to the site even if I didn’t have anything in the cart. They send me an exclusive offer or an extra percentage off to check out now. Really, just by waving a small extra percentage off, I wonder how many sales convert from these simple emails? It really would be interesting to know. Retargeting is also a great way to subtly get buyers back to your site. All of these techniques are so simple, yet really do hold an impact over each and every consumer!